Playwright Martin McDonagh is well known for going more than a little off the rails. When I first saw his work onstage, in The Lieutenant of Inishmore, I was alternately shocked, terrified, and absolutely gleeful with laughter. His recent work, A Behanding in Spokane, now on Broadway starring Christopher Walken, prompts many of the same reactions. 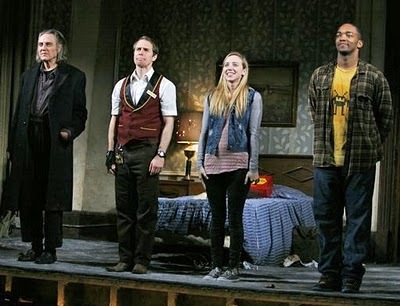 It's a claustrophobic play taking place in a dingy hotel room, with four characters: Walken as Carmichael, an eccentric if not certifiable and imposing character 47 years into a search for his amputated hand, Sam Rockwell as Mervyn, the hotel clerk, Zoe Kazan as "the girl", Marilyn, and Anthony Mackie as "the black guy", Toby. Rockwell's Mervyn was thoroughly enjoyable, and McDonagh gives him a backstory rich in little-boy dreams crushed and the perverse desires of a Kevin Smith character, driven by monotony into wishing for disaster. He and Walken share definite chemistry. Marilyn and especially Toby, however, provide the punching bags for the elements of the play that have been critiqued seriously and fairly in reviews. Both Carmichael and Mervyn are unapologetically racist characters, and the n-word is dropped consistently throughout their dialogue (in fact, throughout all the characters' dialogue), often in one-liners that prompt absolute hilarity in the audience. Marilyn is played as over-the-top as possible, alternately flirtatious, manipulative, apologetic and plain stupid, but never is her character as irredeemable as Toby's, who is sometimes sympathetic and often pitiable but never reaches close to three dimensions, given instead to angry outburts or fits of blubbering and begging. The play's overt racism and homophobia were reminiscent in tone of Quentin Tarantino movies, when often epithets are delivered as harshly as a slap in the face, unclear what purpose is served or goal is intended besides furthering the comedy or simply acknowledging the reality of prejudice. Whether this is a worthy aim depends on your beliefs about theatre, audience, art and realpolitik. What McDonagh does best is plot and dialogue pushed to the point of ridiculous, lines delivered that are so beyond the pale in dark humor they are priceless. There seems to be no better fit for this kind of script than Christopher Walken, an actor who has to my generation become legendary for his delivery, so unique it demands to be impersonated. Carmichael is not different from the Christopher Walkens we've seen before in either his humor, his speech patterns or his weirdness: Vincenzo in Tarantino's True Romance, Senator Cleary in Wedding Crashers, the gardener who is afraid of plants on SNL. For some, the rush of seeing Walken in his element, three rows from the stage, might not have been enough to redeem the play's flaws. But they would have missed a seriously fantastic theatre experience.